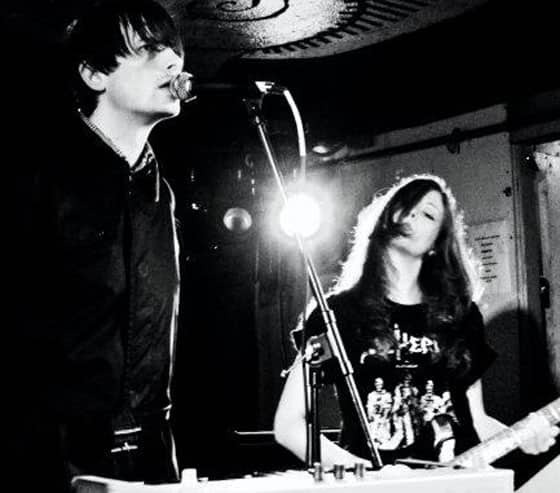 As a reminder to fans of Cold Cave to buy the Matador re-release of the band's debut album Love Comes Close today, the label has made this bonus track available for the low, low price of nothing. You can still listen to the album here before you buy it if you are feeling cautious, but trust us, it is very majorly jamming in a semi-depressing manner. Perfect for autumn! Also, if you're in New York, there is a listening party at powerHouse Arena tonight (details after the jump), and if you're in London, go see the band play at White Heat at Madame Jo Jo’s in a couple hours. Wear black. Download: Cold Cave, "Theme From Tomorrowland"
Tonight, at powerHouse Arena (37 Main Street, Brooklyn NY 11201) in the D.U.M.B.O neighborhood of Brooklyn, Heartworm Press will be hosting a reading event that begins with a special listening party for ‘Love Comes Close’ (Cold Cave merch will be available and you’ll receive a free poster with purchase) As you may know, The Heartworm Press is a limited-edition book/zine publishing house run by Wesley Eisold of Cold Cave and Max G. Morton. This event, will kick off at 6:30 sharp with a playback of ‘Love Comes Close’ followed by readings by the Cro-Mags’ John Joseph, Max G. Morton and Jonathan Shaw. F. Sean Martin (Cage, Hatebreed) will be DJing with visual accompanyment by BeteNoir and the Philadelphia group, Salvation will close out the event. Be sure to RSVP to heartworm@powerhousearena.com - We’ll see you there!